Most of the participants remember the very first time they attended the theater workshop: an atmosphere of mutual trust, support, and respect was what made them want to go back. That and the joy of play. Tania Hernández and Fernando Soto are the actors who lead the theater workshops for children and teenagers in their arts center, The Grand Drape. Xavier Lara, one of their students, shared his recollection: “During my first class Tania was very welcoming with me and with the whole group, she would support us all the time so that nothing would stop us while improvising or representing a character, and this made us feel safe enough to act with self-confidence.” Xavier began attending the workshop when he was 11, and remained doing so until 14. Originally, he was not very familiar with theater. He went there because some of his friends handed him a pass to take a free class. Now Xavier is embracing acting as a career. He points out that “it was a great influence to decide, already from such a young age, that that was what I wanted to study.” Xavier added that attending the workshop helped him become more disciplined and punctual, and through it he learned to listen and respect others and himself. The Grand Drape (El Telón, its original name in Spanish) is Tania and Fernando’s art education project, which also houses their theater company, February 10th (Febrero 10), and a small auditorium for performing arts. El Telón is located in the city of Xalapa, in the state of Veracruz, Mexico. Both actors graduated with BA in Theater and MA in Performing Arts at the University of Veracruz. Both of them came from different and complementary backgrounds: Fernando had previously completed a BA in Pedagogy and, Tania, a BA in Art History. Throughout their studies they found out that theater could contribute to children’s integral education; this became a central concern in their careers. Over the years they have created and participated in several art education programs, some of which have received funding awards from important cultural institutions in Mexico. Interested in developing a method for teaching theater to children and teenagers, they opened El Telón in 2010. Their original project has grown to offer workshops in visual arts, music and dance, as well as art education training for teachers and other professionals. Recently, they have begun hosting programs that allow children from families with low incomes to attend. El Telon’s pedagogy is based on the principles of respect, mutual trust, group spirit, and play – the main ingredient of all exercises. Every session is designed so that each exercise leads progressively into the next, developing each individual’s expressive abilities. As children get to know each other through play, an environment of trust is created among them. This allows students to open up and share their emotions and ideas with the rest of the group, and begin to trust each other. Improvisation is also an important part of learning, since it fosters a spontaneous and creative spirit. Tania and Fernando are also interested in giving their students a chance to stage a play. During the first months of the workshop the teachers focus on observing and understanding the personality of both individual students and of the group as a whole, to find out what their interests are and track recurrent themes. Then they choose three or four plays that could speak to the group. These are handed out to students for reading. Later the group talks about what each member finds interesting about each play, and all of them choose the one they’ll present. They have also presented texts that the students themselves have written. Young people learn technical aspects of putting on a play both on and off-stage. Shows are performed either in El Telon’s auditorium or in others of the city. What is most important for both teachers and students is not necessarily the final result but the process itself: what they learn from each other, together with mutual support and respect, help strengthen their friendship. Tania shared that watching the students’ commitment, excitement, awe, and bonding make her think about her own work as an actress, reminding her of some of the basic principles of theatre such as group work, companionship, and the joy of being on stage. Both teachers emphasize that their aim is not to produce professional actors, though this opportunity has proved important for some students in defining their career choices. 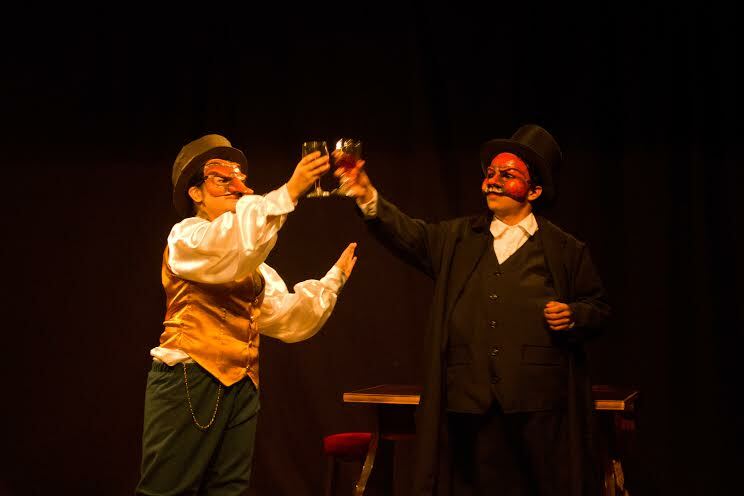 Rather, Tania and Fernando are more interested in providing experiences that allow young people to enjoy the process of learning theater, and to discover its possibilities. They mentioned that this is also helping to develop new publics for professional theater. In my interviews with the students, some of them declared that they have obtained multiple benefits from attending the workshop. These workshops have had an impact on their lives, both in the short and long term. One of the most visible gains is self-confidence, often accompanied by trust in themselves and in their own capacities to achieve goals. Other relevant outcomes are getting to know themselves better and becoming aware of their own potential and limits. They have also become more assertive in their social interactions, being able to communicate their emotions more effectively, and to talk with others without feeling inhibited by shyness or insecurity. They added that they learned to work as a group and became conscious that success depends on mutual help and support. Relieving tension and stress was a result of different activities: some said that while representing a character they felt as though they stopped being themselves for a moment, and, thus, were able to forget stressful or problematic situations they were experiencing in their lives. Others said that spending time with friends and focusing on activities they enjoyed, helped them alleviate feelings of stress, sadness or anger. Instead, the experience made them feel joyful and cheerful. One of these students emphasized that interpreting a character or “learning to change, to be someone else” helped her understand others and develop empathy. Another student mentioned that through interpretation he identified with these “fictional people,” learning from them how to express his own emotions. Most teenagers felt that they acquired an increased mental agility as a result of improvisation exercises. For some, like Xavier Lara, the development of mental agility and imagination went hand in hand. Something else all of them were grateful for was the close friendships they made. Lucía thinks that “in the end we had a very beautiful relationship that El Telón helped us create… As we kept on doing theater, we also got to know each other better… In that process I grew through what I did together with other kids who inspired in me a lot of trust, and that was key.” As Ana Valeria Medina pointed out, these are friendships they still keep. These testimonies help us understand that building an environment of confidence and respect among both educators and students has proven essential for the success of these workshops, and for the personal benefits these youngsters have gained. Something else that comes through is the enjoyment and fun they had while learning, which highlights the importance of joy as an essential ingredient for effective teaching. Specifically in the case of art education, I think it would be useful to consider how enjoyment can help develop long-lasting interest in the arts among young people. Ursula T. Estrada was born in Mexico City, where she currently lives. She has developed and participated in several art education and art museum programs in Mexico and in Canada, some of which have received funding awards from relevant cultural institutions. She graduated from the University of British Columbia (UBC), earning an MA in Art Education, and is currently studying for a PhD in Art History at the National Autonomous University of Mexico (UNAM).